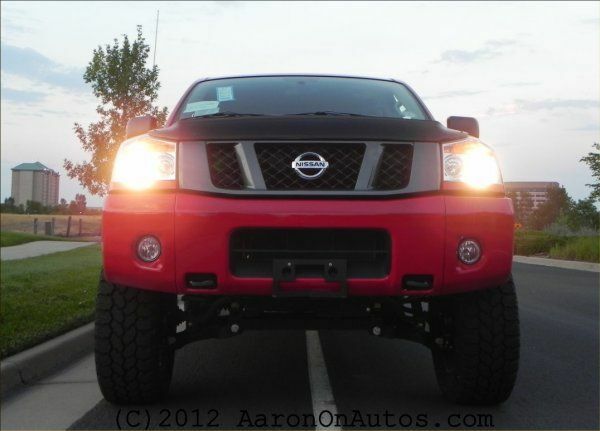 Nissan has listed prices for the 2014 Titan full-sized pickup truck, though the diesel option is missing from the list. More on that in a moment. The Titan is being offered in both King and Crew cab and in two- and four-wheel drive options. Models include the base S, the SV, the Pro-4X, and premium SL. Wheelbase options include Standard and Long. The Titan is built on the F-Alpha pickup platform which features a long-proven 5.6-liter dual overhead cam (DOHC) Endurance V8, 317 horsepower engine producing 385 lb-ft of torque. Its five-speed automatic transmission (standard) offers 9,500 pounds of towing in the King Cab and 9,400 pounds of towing in the Crew Cab box. The standard wheelbase is 139.8 inches, offering two bed lengths depending on cab option. The long wheelbase for the 2014 Nissan Titan is 159.5 inches and allows for the long bed option. The following manufacturer suggested retail prices (MSRP) do not include destination and handling. The King Cab box in 4x2 is offered in an S or SV trim, which sells for $29,270 and $31,700 respectively. In 4x4, the S sells for $32,120 and the SV for $34,550 while the top-selling Pro-4X sells for $37,490 in this King Cab configuration. The King Cab is offered only in standard wheelbase. The Crew Cab (four-door) option in 4x2 can be had in both standard and long wheelbase in three trim levels. The S 4x2 Crew Cab is $31,820, the SV SWB is $33,900, and SL SWB is $40,490. The long wheelbase (LWB) SV Crew Cab is $34,350 as a popular choice for work crews. In four-wheel drive, the 2014 Titan in SWB comes in four trim levels with the LWB being offered only in the SV trim at $37,230. The S Crew Cab 4x4 starts at $34,670, the SV at $36,750, the Pro-4X at $39,690, and the SL premium trim at $43,190. Again, all prices do not include destination. Missing from this list, of course, is the new Titan Diesel being offered for 2014. That will be announced at a later date, likely when the truck debuts in the coming weeks. The diesel offering is of huge interest because it's a massive V8 Cummins producing 550 lb-ft of torque. This makes it the largest diesel offering in the half-ton pickup truck market and one of the largest offered in the heavier three-quarter ton (2500) market as well. The gasoline versions of the 2014 Nissan Titan listed here are now available in dealer showrooms nationally. The Titan is built alongside the Armada at Nissan's Canton, Mississippi plant.